The electron rocket being transported to a launch pad prior to liftoff at the Rocket Lab Launch Complex 1 on the Mahia Peninsula, North Island, New Zealand. 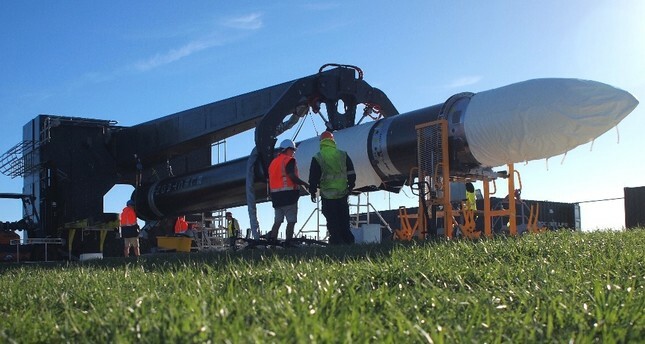 Private space company Rocket Lab successfully launched its first fully commercial rocket yesterday, moving one step closer to its goal of offering regular commercial access to orbit from a New Zealand launch site. "Lift Off," the company confirmed on Twitter at 4:50 pm (03:50 GMT) followed by "All payloads deployed. It really is business time." The 17-meter rocket launched from the Mahia Peninsula in the Pacific country's North Island - from the world's first privately-owned orbital launch site - laden with six satellites. The satellites are from Spire Global, Tyvak Nano-Satellite Systems, Fleet Space Technologies, as well as an educational payload from the Irvine Cube Sat STEM Program, built by high school students in Southern California. On board is also a test drag sail, dubbed Pride of Bavaria, built by Munich company HPS GmbH, which aims at de-orbiting satellites faster. Yesterday marked the third attempt to launch the mission after it was postponed twice due to technical difficulties earlier this year. It follows Rocket Lab's first successful test flight in January, which reached orbit and put three small satellites into space. So far companies have to "piggyback" on major rocket launches, within orbit or launch windows. Rocket Lab's wants to remove these barriers to commercial space by providing frequent launch opportunities, aiming for weekly launches for commercial clients by the end of 2020 year at a cost of approximately $4.9 million. In comparison, 83 successful launches were made worldwide in 2017, of which 64 operated by commercial companies and the rest by space nations like China, India and Russia. "There is a tremendous transformation that is currently underway in the commercial satellite industry as demonstrated by the record number and type of satellites launched in 2017 and the revenue growth in manufacturing, earth observation and satellite broadband revenues," the Satellite Industry Association said in its annual industry report earlier this year. Rocket Lab's Electron rocket uses 3D-printed engines and is designed to send small payloads, such as imaging and communications satellites weighing up to 150 kilograms, into space. NASA is one of the other companies who have already signed up for future launches. The space agency is using small satellites to advance exploration, demonstrate emerging technologies as well as conduct scientific research and educational investigations. "The advent of right-sized, very small launch vehicles opens a new era of possibility for small satellite developers," said NASA's Scott Higginbotham. "We look forward to exploiting this exciting capability." "We're FedEx," Peter Beck, the New Zealand-born founder and chief executive of Rocket Lab told The New York Times. "We're a little man that delivers a parcel to your door." A new production facility that was opened in Auckland last month by prime minister Jacinda Ardern and "Star Trek" star William Shatner is aiming to build, test and launch an Electron rocket every month in 2019 and every week by the end of 2020. The company has already lined up another mission for US space agency NASA in December.